This isn’t just a plea for cyclists sake. 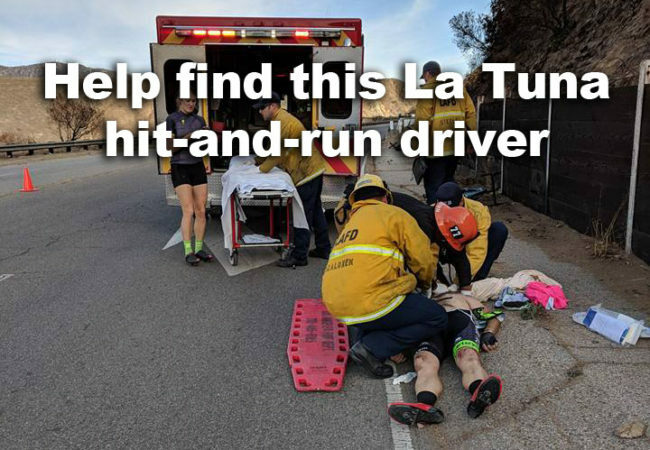 Another cyclist fell victim to a hit and run this Saturday causing serious injuries along La Tuna Canyon Road. The driver who couldn’t be bothered to stop was driving a Black Mazda SUV that sustained damage on the front. Be on the lookout and please report any vehicle that looks like a match. My anger is that La Tuna is known for high speeds and dangerous activity. There has been an average of one person killed on this stretch every year since 2013. While there are many dangerous roads in Los Angeles, this one is a bit different from others. 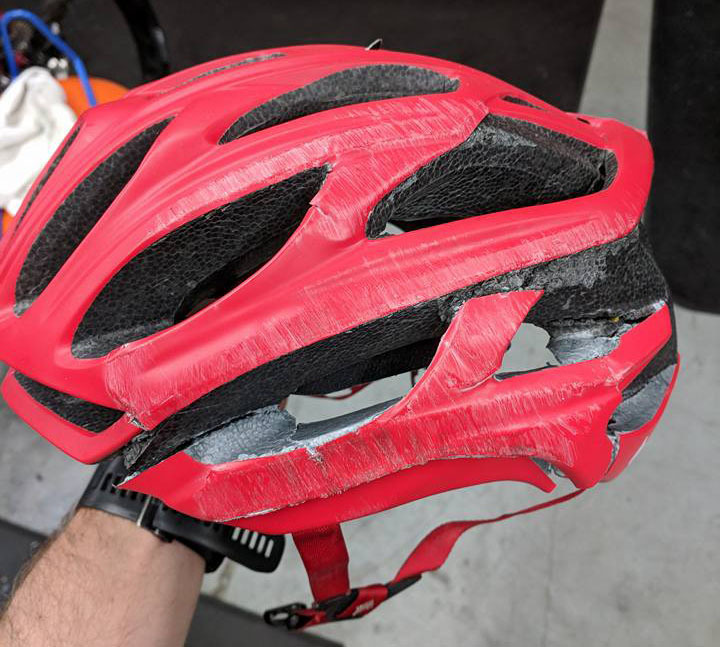 This helmet served its purpose. For about a century’s worth of time, this six mile road has provided a link from Sun Valley to La Canada. In 1966, the 210 Freeway opened acting as an extension of La Tuna from La Canada to Pasadena increasing it’s usage. Things changed in the 70’s as the Freeway eventually connected with the I-5 providing a more efficient thruway, especially for those coming from the Simi and Santa Clarita Valleys. La Tuna still is a cut through, but only gets a moderate amount of traffic during rush hour with no backups over this stretch. A good portion of La Tuna has a 50 mph speed limit (the residential area is set at 45 mph) and you could imagine that with clutter at a minimum, speeds exceed those numbers. Despite these high speeds, the low volume of cars is part of the draw of riding La Tuna. 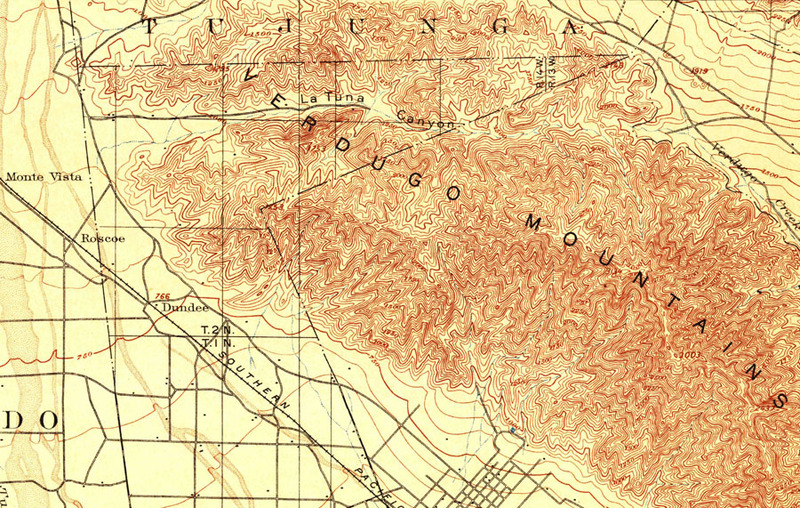 A map of 1900 showing La Tuna at about half its length. 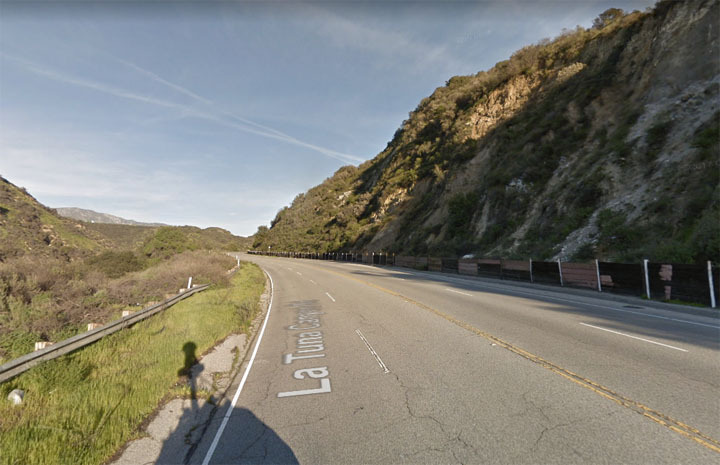 It’s a popular road for Valley cyclists as one of the best ways to get around the Verdugo Mountains. If you’re coming from the west, the first half of La Tuna feels easy with a slight incline along with bike lanes. There’s a stoplight near the start serving as the only impediment to slow down traffic. As the bike lanes disappear, La Tuna becomes a much different street. The incline more than doubles, the center turn lane narrows until it disappears and the road now has two lanes in each direction. This drastic change is in part that La Tuna originally went only this far and this extension was drawn up on different engineering standards. La Tuna can be empty, but also is very dangerous. Strangely, the shoulder varies in width to very wide to non-existent. Even when you choose to ride there, the surface conditions are poor and you’re likely to come across a lot of trash. It’s in this area where Keith Jackson was hit. As of last night, he is still in an ICU in a stable, but unconscious state. The road to recovery is going to be a long one, but he has a lot of support. While this driver must be brought to justice, we also owe it to all to make this street safer. Remember when I mentioned the five deaths on La Tuna? Of the last eleven people to lose their lives here, ALL of them were killed while DRIVING. 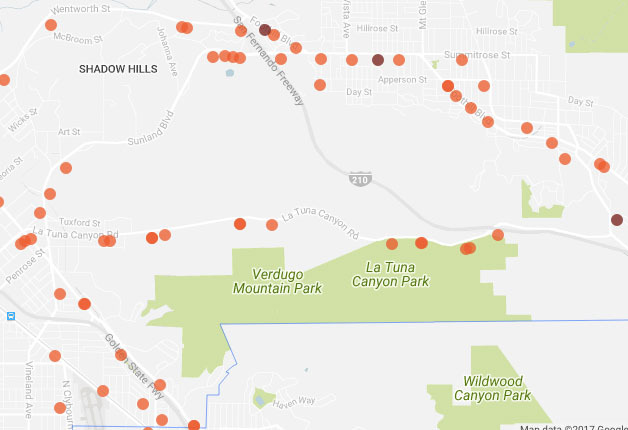 Map of all the traffic deaths on La Tuna the past 15 years. What even exemplifies how dangerous the road is, there is even a Facebook Group for traffic reporting on it. Plain and simple, this road is engineered to be too fast. La Tuna is slated to have a bike lane for its entire length as stated on Mobility Plan 2035 and even if this eliminates the double lanes, this is not enough. To make a road like this significantly safer, a number of measures need to be added, but it’s hard to say if this city has the commitment to do anything. Please be on the lookout for this Black Mazda and spread this story. Let all the people you know that these life threatening incidents are unacceptable.